If you read “Ghetto Brother” you know that after the gang truce came the music. The Ghetto Brothers were one of the first gangs to invite others to their turf to peacefully party together. A year after the Hoe Avenue Peace Meeting, also thanks to the media attention the GBs were getting back then, Benjy and his brothers recorded an album, “Fuerza/Power” — listen to the sampler here. 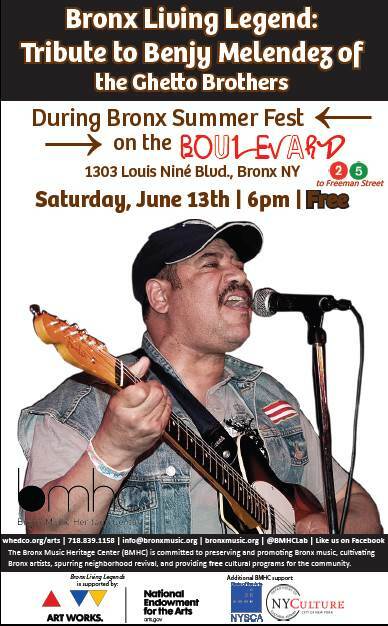 This Saturday, Benjy will be honored in the Bronx — and the Ghetto Brothers will give a free concert! If you’re in New York, you don’t want to miss this (and yes, we’ll be selling copies of the graphic novel there as well).